Today was another GREAT day to BE A Lion and to BE WITH Lions! 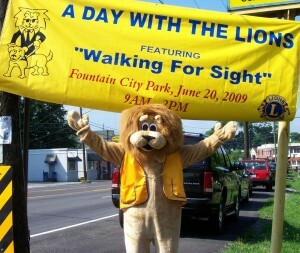 The Day with the Lions and Walk for Sight event is a major fundraiser the the Lions of East Tennessee. 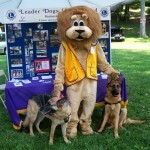 From what I’ve learned, all the Lions clubs in our district support nine agencies. 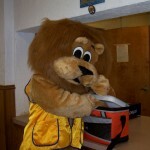 Visit the Lions District 12-N web site to learn more about the agencies who benefitted from the funds raised. I have so many terrific pictures from the Day with the Lions, it was difficult to select just a few to share with you here. Please check out my photo album. 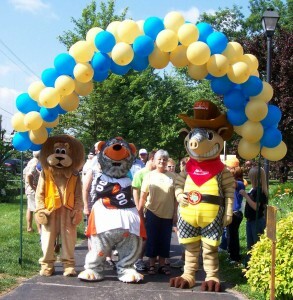 The Walk for Sight began shortly after 10:00 a.m., and I had the privilege of being right at the front with two other mascots: Chilly from the Knoxville Ice Bears and Andy the Armadillo from Texas Roadhouse. We weren’t the fastest walkers, and occasionally got side-tracked to visit with people but it was a neat way to kick off the important Walk for Sight! * Participated in the Cake Walk – and just missed winning some goodies by ONE seat! * Played a piano – not that well, mind you, but played nonetheless! 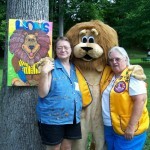 * Made an attempt to accessorize my gold Lions Vest. . . with a pink purse? 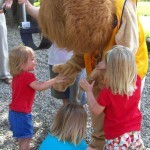 * I was even a little ornery in attempting to sneak a snack from someone’s cooler, but was busted by a photographer! As you can see, it was a busy, fun-filled day! Thank you to PDG’s Wendy Cain and Kaye Forester for walking with me, keeping me hydrated, and taking pictures. Also special thanks to other photographers who have forwarded their pictures for my albums! Here’s the link again to the photo album. I hope you enjoy them!